The SKYCITY Breakers have today confirmed the final four places on the wider 2015/16 ANBL roster with confirmation of the four players on development contracts for the new season. The four players have all been signed following the highly successful Rookie Camp held at the club two weekends ago, with players from around the country invited to trial to be a part of the team for the coming seasoShea Ili, Jordan Ngatai and Tai Wynyard return for further seasons as development players while Finn Delany is the newcomer amongst the group, after the 20 year old impressed at Rookie Camp after doing likewise during recent Tall Black trials. The club has chosen to go with four players, with Tai Wynyard signed on a non-payment contract that protects his amateur status ahead of taking up his scholarship at Kentucky University in the USA. Teams can name up to 12 players on the roster for all home games, with development players eligible for consideration each week. NZ Breakers Development Player 14-15, Tall Blacks ’13, Wellington Saints ’14, Manawatu Jets ‘15. Prior to joining the Breakers Jordan had a year playing NCAA Division 2 college basketball at BYU Hawaii where he averaged 7.7 points and 3.8 rebounds for the Seasiders. Played New Zealand NBL basketball in 2015 for Manawatu Jets. Unfortunately he carried a foot injury, incurred late in the Breakers season, into his NBL season and that affected his early season form. However he finished the campaign strongly averaging 13.5 points and 5.3 rebounds for the Jets. 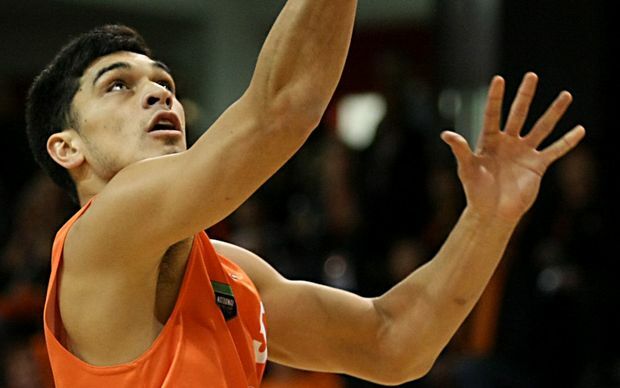 Debuted for the New Zealand Tall Blacks in 2013 and a strong 12 months could see the versatile forward back in contention for an international spot next year. The oldest of the four development players at 22 years Ngatai made 7 brief appearances for the Breakers last season and will be keen to log more minutes in this campaign. An outstanding defender he was a key figure, alongside Breakers teammates Tai Wesley and Duane Bailey, as the Southland Sharks lifted the 2015 New Zealand NBL championship. He averaged 9.4 points, 4.3rebounds and 3.6 assists for the Sharks. In July he made his international debut for the New Zealand Tall Blacks and late in the second Oceania Olympic Qualifying game against the Australian Boomers underlined his defensive prowess as he caused NBA stars Patty Mills and Matthew Dellavedova some anxious moments. Needs to develop his point guard leadership and his outside shooting ability but there is no doubt he possesses the quickness and athleticism to be a success at ANBL and international level. NZ Breakers Development Player 14-15, Tall Blacks ’14’, 15, Super City Rangers ‘14, ’15. Tai Wynyard returns for his second season as a Development player having made 2 appearances last season. Tai has had a sensational past few months on the basketball court. In July 2014 he became the youngest ever New Zealand Tall Black when he debuted against South Korea. Three months later he became the youngest SKY CITY Breaker when taking the court against the Adelaide 36ers. Tai again made headlines in June 2015 when he was a member of the New Zealand team that won gold at the FIBA Under 18 3 on 3 World Championship in Hungary. In his final year at Rangitoto College the 17 year old has committed to the University of Kentucky. Wynyard will play a significant role for the Breakers while Alex Pledger recovers from his toe surgery but it remains to be seen if the Breakers will seek dispensation to enable the young forward to play road games during that time. Just 20 years of age and Finn has already played 47 games over three seasons for the Nelson Giants in the New Zealand NBL. Averaging 6.1 points and 3.3 rebounds Delany helped the Giants reach the semi-finals in the recently completed 2015 NBL season. He played the 2014-15 season at SW Baptist University, Missouri and averaged 9.0 points and 4.7 rebounds. He also enjoyed terrific shooting percentages – 54% FG/40% 3PG/80% FT.
Delany is currently studying Commerce at Otago University and will join the team permanently following his exams.